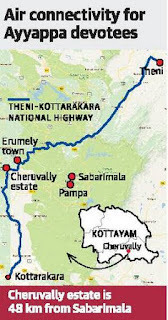 It has been very shocking to find out how K P Yohannan, the self-proclaimed preacher and his relatives from Tiruvalla had purchased the Cheruvally estate from Harrisons Malayalam plantation in 2008. The deal itself was flawed as Harrisons did not have any right to sell leased land to KPY. Though on paper it is only for Rs 80 crores in white, we are not sure how much more money has been paid under the table. KPY's Gospel for Asia is under scrutiny for having received Rs 1050 crores+ from US for missionary work which has been illegally diverted for purchasing land. The Rs 2500 crore joint venture Sabarimala international airport between NRis and state govt is going to be a prestigious project for Kerala state and the state authorities should lose no time and effort to take over the 2263 acre Cheruvally estate for the purpose of building the airport which will benefit devotees visiting Sabarimala, Lord Ayyappa's shrine in Perunad, Pathanamthitta dist, 48 kms away at an altitude of 1260 m above MSL, situated among the 18 hills comprising the Periyar Tiger Reserve. In comparison the nation's third largest airport (in terms of infrastructure and fourth in terms of passenger traffic) at Kochi is on just 2000 acres of land while the nation's fourth largest, Bangalore International airport is on 4500 acres of land. KP Yohannan who has been masquerading as a preacher is a self anointed religious leader who through his US entity Gospel for Asia has been amassing huge amounts of money from US to be used for helping the needy and downtrodden through his domestic entity called Believers Church. Yohannan has been using the foreign funds to amass real estate assets for the church and his family members. He is a married man and has no rights to establish a church claiming power from the throne of St Thomas. He needs to be exposed and taken to task. Let us hope the Kerala govt gets a little more serious in exposing KPY and putting him behind bars.These are some people who bring bad name to all of us ..